If one looks back on the life cycles of past consoles, more than a few items are bound to pop up that never reached consumer hands. It can be quite fun actually, to read about controllers, accessories, and even games which never were. The Atari 2600’s “Puffer Project” exercise bike, the NES lottery modem, and even the unreleased Star Fox 2 for the SNES (which, coincidentally, has been finished and released in ROM form by the Aeon Genesis Translation Project) were all announced and hyped but resulted ultimately stillborn. You may be asking yourself how the Genesis fits into all of this. That’s actually a simple question to answer and even though our favorite console is more famous for having accessories released only to be quickly abandoned (Menacer? 32X? ), it also bears membership to the club of systems mentioned above. Sega spent quite a fair amount of coin on R&D for several projects during the Genesis’ life span but one particularly stands out. This would go on to become the single greatest piece of vaporware of the 16-bit generation, comparable perhaps only to the SNES’s ill-fated CD-ROM. In 1991, Sega announced that work was underway on a virtual reality peripheral that was supposed to usher in a new era of gameplay. Dubbed the Sega VR, the project consisted of a complex IDEO headset which would allow the gamer almost total immersion in the game they were playing. Its dual LCD screens were accompanied by stereo headphones and the entire unit rested on a comfortable headband that would fit the shape of the user’s head. An adjustable elastomeric band which ran lengthwise over the head helped minimize its weight and reduce strain. The headset appeared to be pretty advanced, merging three separate technologies for 3D realism, movement tracking, and stereo sound to produce a full 3D world and the entire experience was created by mimicking the actual human sight process. Upon focusing on an object, our eyes each receive a slightly different image which are both then fused together in the brain, giving us our sense of three dimensions. This is known as binocular parallax and is the basis for 3D movies. The Sega VR headset’s dual LCD screens would recreate this effect, similar to the Master System’s LCD 3D glasses, only on a much more powerful scale (called “stereo vision” by Sega). The sense of immersion came from the headset’s ability to track the movement of the user’s head and react accordingly. For example, if something flew over the player in the game and he moved his head to follow, it would stream seamlessly over to that portion of the sky, showing everything in the direction he faced. This was accomplished through its internal sensors, which monitored head movement more than 100 times per second. Four games were slated to be packed in with the headset: Nuclear Rush– a hovercraft simulation, Iron Hammer– a helicopter gunship simulation, Matrix Runner- an action/cyberpunk adventure, and Outlaw Racing- an anything-goes type racing title. 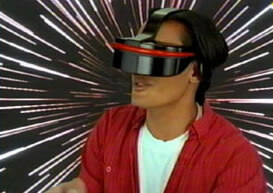 Yes, the Sega VR technology promised to revolutionize the way games were played and designed, or so Sega thought. They thought wrong. 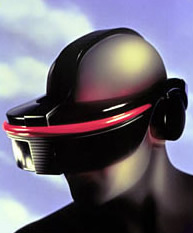 After being featured in several magazines, as well as at numerous trade shows, the headset made its final appearance in 1993 at the Consumer Electronics Show (CES). It was shown behind closed doors to a thoroughly underwhelmed audience, with one GameSpot writer describing the game he played as an unresponsive blur which quickly lost any and all appeal. The whole project never progressed beyond the prototype stage and Sega officially claimed that it was halted due to users hurting themselves by moving while wearing the headset. They stated that the sense of immersion was so realistic, it could potentially cause injury to children who played it. However, anyone who has played their Genesis for more than ten minutes knows that this is impossible, given the limitations of the hardware. The most likely scenario probably had to do with the unit’s inability to produce a satisfactory effect. There were reports of testers getting motion sickness while playing and up to 40% of the users during development got “cybersick.” None of the four announced games were ever shown to the public and no other titles were ever announced. Unable to create the true, lifelike sense of immersion they had promised, Sega wisely pulled the plug in 1994 and Sega VR faded quietly into obscurity. Take a look at the games in action. It’s an amazing glimpse into what could have been. Our thanks to Grooveraider for the video! Even as Sega was striving to overcome the hurdles it faced with its own helmet, another company called VictorMaxx was dilligently working on one of their own. 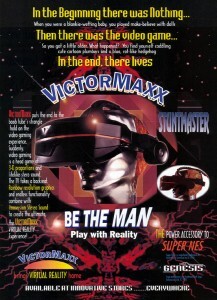 Known simply as the VictorMaxx Stuntmaster Headset, it was supposed to offer monoscopic (only one screen for viewing), color, and stereo sound for under $200, but reports suggest it retailed for around twice that price. It was compatible with the SNES as well, via a separate connector cable that was included. Meant mostly for first-person titles (such as flight simulators), the VictorMaxx helmet featured a tracking rod that users would clip to their shirts, activating the left and right sides of the D-pad when they turned their heads in those directions. Unfortunately, the results were what you’d expect from such early technology. The low-res screen (about 300×200) and limited number of colors combined for a very unspectacular picture. Worse, there was no contrast button, so blacks appeared grey, and light would leak in from the sides, washing them out even more. The narrow field of vision, along with the mediocre sound and heavy weight (the whole unit came in at around five pounds!) made it more of a chore to use than a viable gaming alternative. Units were eventually relegated to bargain bins, and boxed ones — great for hacking, such as adding RCA cables — can be had on eBay and flea markets for a song. A decent buy for anyone eager to watch television through a headset. Though VectorMaxx was actually able to do something Sega couldn’t: get its VR helmet to market, the result was decidedly similar: total consumer apathy. Few remember the release today, and this important first step in making a VR helmet a reality has all but been forgotten. These bitter experiences are by no means reason to point a finger at Sega and VectorMaxx and laugh. Virtual reality has long been the bane of hardware companies in the console industry, besting even icons like Atari and Nintendo. Fans of the Atari Jaguar might remember that console’s failed attempt at a virtual reality headset which was developed by Virtuality. Set to retail at $300, it actually got farther along than Sega’s did, even featuring a built-in microphone, but lagging console sales and a mounting deficit caused Atari to shelve the project permanently. Only a single game was ever put into production for it- a 3D version of Missile Command. 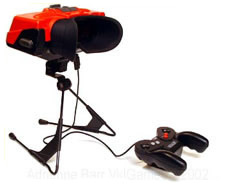 Nintendo by far suffered the worst blow of the Virtual reality fad with its abysmal Virtual Boy, spending $5 million just for exclusivity of the technology used in the system. Another $20 million was spent on the August, 1995 U.S. launch. Notwithstanding, the $180 price tag, combined with the clunky design and the lackluster software lineup, signaled its demise a little over a year later. Sony would also eventually try a headset of their own in 2002. Released only in Japan, the PUD-J5A was used with a jet fighter game called Energy Airforce Combat Fighters. Weighing in at an incredible 12 ounces, the set could be stored in a desk drawer. It provided the equivalent to a 42-inch screen at several meters distance and had both s-video and standard RCA inputs. The downside? It cost about $600. Needless to say, its mainstream marketing impact was next to nil. What was once believed to be the next level in gaming turned out to be another infeasible fad that died a fiery, horrible death with four of the biggest hardware manufacturers in the history of the industry suffering third degree burns. All we need now is for Microsoft to announce a headset and the circle will be complete. To be honest, one must be quite wary when it comes to companies proclaiming the “next big thing” that is supposed to revolutionize the industry. Such claims are usually followed by massive cash hemorrhaging and lots of layoffs. Remember how full motion video was going to turn the industry on its ear? Though virtual reality gaming is a lot more attractive than FMV, it ultimately turned out to be something that simply extended far beyond the reach of the technology of the time. Perhaps someday consoles will catch up with the ambition of developers and finally give us the true 3D experience. Until then, virtual reality will remain nothing but a fantasy. Bayer, Glen. “Virtual Boy Hardware Profile.” N-Sider. February 20, 2004. Heavy Equipment. Sega Visions Magazine. August/ September, 1993. MacDonald, Ryan. “The Past, Present, & Future of Gaming.” GameSpot. 2004. “Mighty Barfin’ Power Rangers.” Earth Island Journal. Fall 1995. News Archive at Digit-Life.Com.” Digit-Life.com. September, 14, 2002. “Prototype & Design.” The Apple Collection. October 10, 1998.